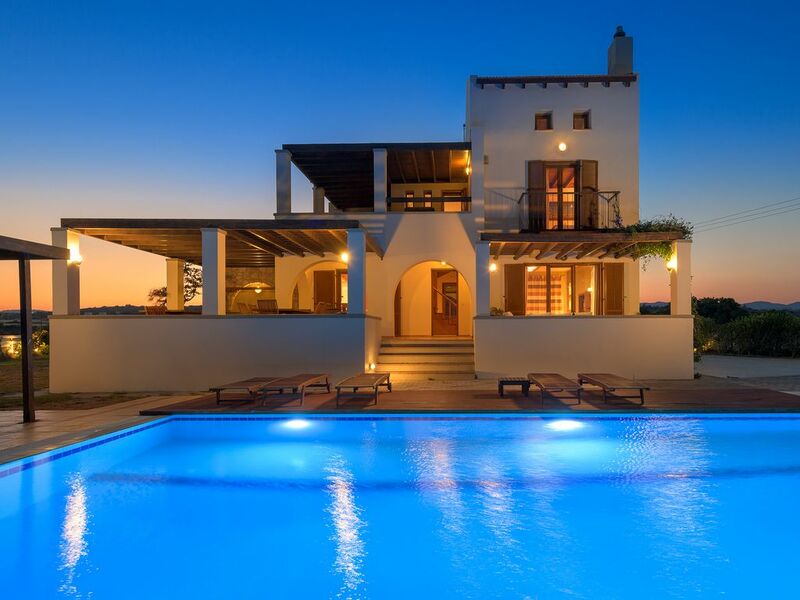 Villa With Private Pool, Garden, Breathtaking Sea View And Beach. A spacious, tastefully designed, modern villa just by the beach and the deep blue tranquil sea, an ideal destination to introduce you to the unique colour of the Aegean Islands. Just a few minutes away from the picturesque village of Lahania and a few more from the ancient castle and village of Lindos where history is still written after ages of glory, wealth and fame. Although its situated amid the serene wheat fields; that will allow you to slow down and enjoy the pleasures of the exquisite nature its only a drives way from hot spots for amazing food, coffee shops, bars and carefully cared little shops for your souvenirs and memorabilia at the nearby villages. If you are looking to satisfy also your quench for site seeing and adventure you will be able to visit unique places such as the amazing double beach of Prasonisi, the medieval castle of Asklipio and the Italian ruins of Kattavia. A graduate of the Aristotle University of Thessaloniki (Department of Biology). Worked for Coca Cola 3E for 13 years, during which time held the positions of, General Manager for the Dodecanese, Regional Supply Manager for Crete and Rhodes, Technical Manager for Rhodes Factory. Has a vast amount of experience in Personnel Management, Strategic Planning, Organization Management, Production, Quality Control, Logistics and Sales. From 2005 to the present has been active as a Business Consultant specializing in the fields of Quality, Improvement of Productivity and the Development of Personnel. Married with Evaggelia, 2 children, Nena(1995) George(1999). En-suite bathroom to bedroom 1 with shower and WC (1st floor). Bathroom with shower and WC (1st floor). Guest WC in the living room. Outdoor shower. Notes on accommodation: The villa is fully air-conditioned and there is independent solar water heating. All costs for water, air-conditioning and electricity are included in the price. Outside: The villa is surrounded by gardens (1700sqm) with lawn that makes it an ideal place for children. The villa is fenced. There are 4 spacious sheltered verandas equiped with 3 wooden tables with chairs and garden furniture. There are sun loungers and umbrellas by the pool. The pool is 12m long and 5m wide. You will also find a barbecue and an outside shower. There is also a private parking space. Utility Room: Washing machine, iron and ironing board. Cleaning / Towels / Linen / Maid service: Two sets of towels and white linen are provided for every week stay. Other: Baby cot and chair is available. As good as the pictures! Super house, beautifully presented and to arrive at 1am and find essential groceries was a much appreciated touch. Generous bedrooms, lovely terraces. It is set back off the main road leading from the North to the South of the island. It didn't bother us but may do for others. Whilst it is at the quieter end of the island this very much suited us. Car hire essential and lots to see and do. Lindos with it's pretty harbour, roof top restaurants and colourful shops was our "go to" place for evenings out (around 30 min drive?). We had a great time here in June. The villa has lots of room and could easily sleep a few families with a massive top floor room for kids. The photos of the interior definitely do not do it justice. The pool is brilliant and the beach is a 5 minutes walk. It's 1-1.5 hours from Rhodes airport but if you want away from the tourist crowds, which we did then its ideal. There are a few things to note; The front of the villa and so the pool is on the main road that circles Rhodes. It is not continuous traffic but it can get noisy. The host was quick to get back to us and did everything he could to make our holiday special including providing food for us as we were arriving late. There is a lovely local village (Gennadi) with a great bakery and a supermarket a five minute drive away. There are also a few bars and places to eat. Venture a bit further for a water park! Thank you Andrew for your good words. It was so easy to book this villa and make the payments as Dimitris was really helpful, and also sent over all the information for our arrival well in advance, which was a load off our mind. Unfortunately, the property manager Kate hadn't checked the bookings and as we booked fairly late she hadn't noticed that we were coming to stay. On arrival at the villa we had to call her as it hadn't been cleaned since the last guests vacated. She sent two cleaners and arrived herself within and within three or four hours the house was ready for us - so the mistake was sorted out, but after a long flight and a very early start it wasn't the most ideal start to our holiday. The house is as pictured if not even nicer, the bedrooms are in much calmer tones than they appear in the photos and they're very comfortable. The plumbing needs a look at as we had a few loos that were a bit dodgy - either the flush was constantly running or sometimes the flush didn't work at all. The best thing about the house is all the different seating areas - you can avoid the strong winds, or hide from the sun, or bathe in it - whatever you wish, I'm not even sure we managed to use all of them! It's a pity there were no tools for the bbq, we used it and made do with kitchen tongs but it would have been much easier if there were just some simple tongs etc. Also there was no net to clean the pool, and no one came to clean it so it was a bit of a chore trying to pick out big dead insects while swimming around. Also with such a beautiful big pool, it just makes sense to have a pool cleaning net. The welcome basket was so appreciated with coffee and tea and bread etc. but when we arrived and asked how to walk down to the beach, no one told us so it took a lot of figuring out. Also, we only discover on our very last morning that there are lots of inflatables in the cupboard under the stairs! Shame! A little note/booklet explaining the house would be ideal. The beach itself is fairly rugged, but the sea is very clean. Mojito and Ammos are both lovely beaches, but head up to Glystra for the best beach in the area. Platanos was our favourite restaurant (in Lahania) and then the Light house in Kiotari and Philosophia in Peskos. It's fun to drive to little towns like Kattavia or Appolakkia as people are so friendly. Definitely need a car as there's nothing in walking distance, easy car parking space and the gate makes everything feel secure. Thank you very much for this sincere and objective criticism. I will take your words into consideration so as to improve the stay in the Villa as much as possible. It was very kind of you to make this beautiful and flattering comments about the house. I hope you enojyed your stay despite the difficulties and the obstacles. We're waiting for you again any other time. The house is literally next to the sea and it takes only 5 min to walk down to the nearest beach. This beach is unspoilt and half sand half pebble. The water is crystal clear and it is one of the cleanest beaches on Rhodes. Here you are undisturbed to enjoy your holiday in privacy. Rhodes airport (Diagoras) is 65km from Lahania. You can take a taxi, bus or rent a car at the airport. A car hire is recommended especially if you want to explore the island. The villa is 2km from the picturesque Lahania village, 6km from Gennadi, 15km from Prassonisi and about 25km from Lindos. Booking Notes: Upon booking there is a 25% deposit payment to be made and the full amount is payable 8 weeks before arrival. Additional to the booking fee there is a 300 euros damage deposit to be paid in advance and be returned on the day of departure if there are no damages to the property. Payments are made by bank transfer. Notes on prices: The price is for a week up to 2 person, for every extra person the cost is 55 euros per week. ThePrices are for the property per week in euros.